In the Autumn, we take part in the fair at Hurst Green - in 2016 and 2017 our Chocolate Tombola was a great hit! We have provided various forms of entertainment over the years - from bookstalls, to pirate ships with the occasional fruit tombola and always with the unrideable horse. The Rotary Club of Titsey & District is organising its 13th Oxted Boot Fair on Master Park in Oxted. The event raises funds for charities supported by the Club, including Master Park. Pitch set up from 09.00hrs; official selling from 10.30hrs. 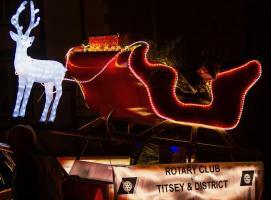 The sleigh is stabled until Christmas - watch this space for news of Santa's visit in December.